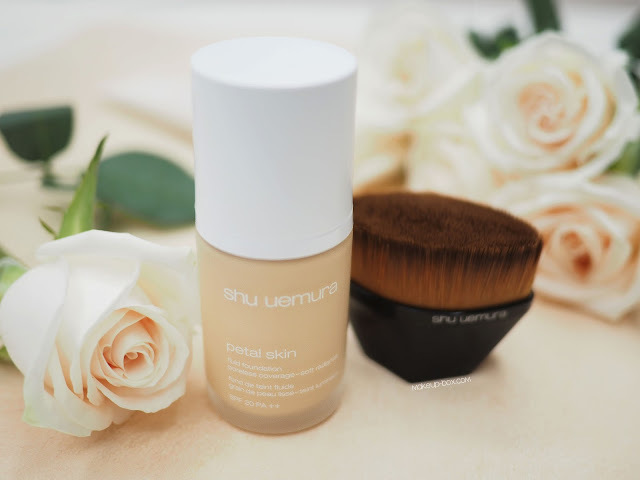 Petal Skin Fluid Foundation (S$68) launches today (1 April) in Singapore, and is a welcome addition to Shu Uemura's foundation series. Built around the idea of fresh, smooth "effortlessly radiant" skin that looks like a flower petal, the formula aims to combine semi-matte with semi-glow characteristics in a lightweight, velvety smooth formula that feels comfortable and natural on the skin. I've been test-trying this for the past few weeks now, and I'll say I love the finish and effect this has on the skin. My pores instantly looked "filtered" as I rubbed it on. The formula contains a unique volatile fluid that glides over skin and disperses pigments in a thin layer, where they bounce light off in a smooth, even sheet for that smoothed-out effect. It also subtly corrects texture and is not settling into or around pores and fine lines or emphasizing them. Like the pigments in some of the Lightbulb powders, the ultra-fine reflective powders are also spherical so they don't sit on top of the skin in a matte, cakey layer, but diffuse light so you look "lit from within". 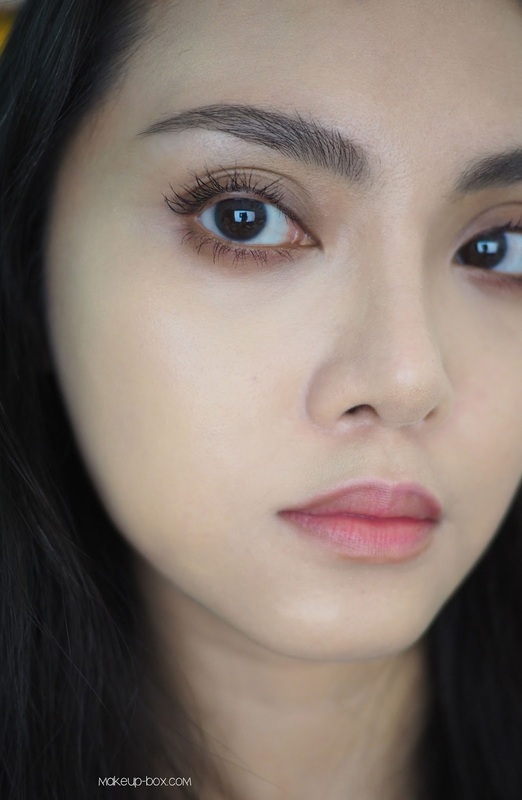 I'm endlessly fascinated by formulas that manage to bounce light without making you look shiny or emphasizing all your pores and this one does it very well. 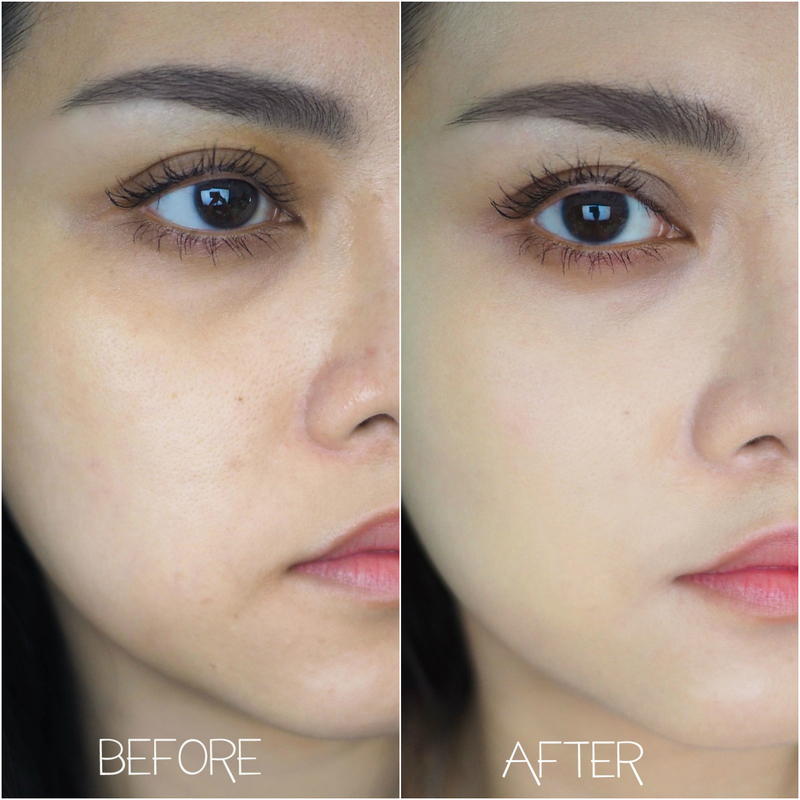 While this doesn't give high coverage like The Lightbulb or Smooth:Fit, it managed to give decent coverage and unify my skin tone quite well. I need less concealer when I use this, but if you have active spots or darker pigmentation to cover,this will not have enough concealing power on its own. You CAN build this up a bit more, and I did try it with 2 coats (below) for a more perfected look, but I would not advise going any thicker because there's no point in losing that fresh, "my skin but better" effect. I wore this for full days out, and it holds up beautifully on my normal-ish skin, in humid weather, for about 6 or so hours without any blotting, if I set it with a little loose powder. The formula has been tested in Singapore weather so it is quite humidity- and heat-resistant. However, I do need to point out this is not an oil-control formula even though the fresh texture and semi-matte finish will be appealing to oily and combination skins. 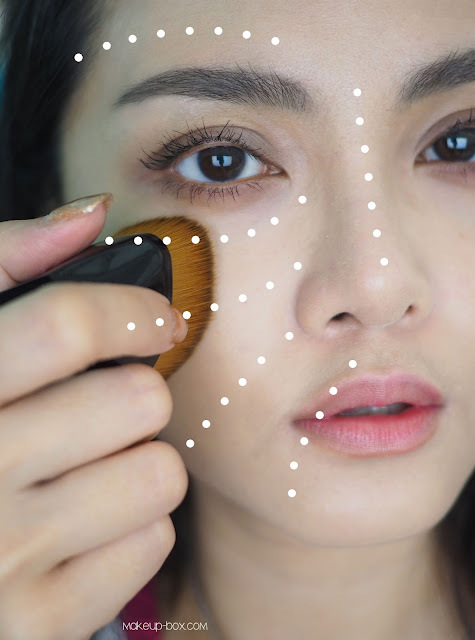 You should lightly blot to lift oil from skin every few hours regardless of what formula you are using, if you want makeup to stay fresh longer. 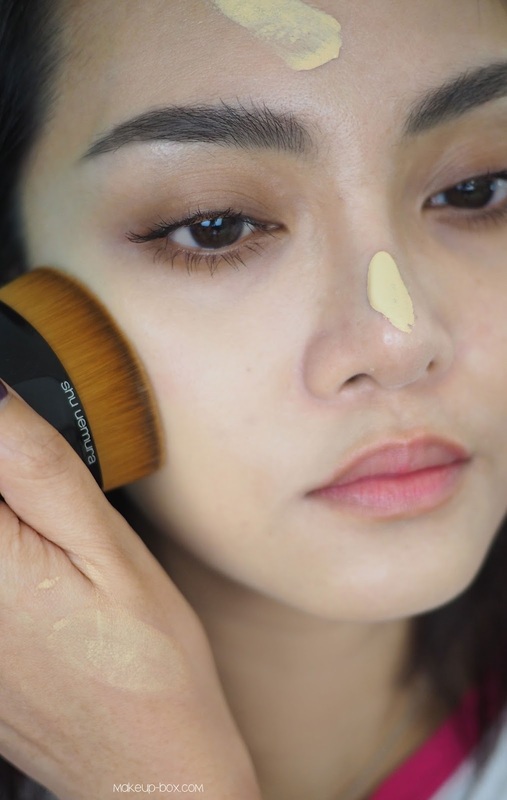 Primer and powder will help obviously, but skin continues to produce oil through the day, so the best way to prolong your makeup is to lift it off before it breaks everything down. On days when I've been going in and out of our hot steamy weather and didn't blot at all, the foundation did break down at the end of the day, which is to be expected of any formula. However I had minimal "fading" in terms of coverage, even if I didn't look quite as velvety and flawless after a long day. Normal and dry skins can get by without using powder if you want a slightly more radiant "my skin but better" effect. The formula contains white lily extract and deepsea water for hydration, and white jasmine for promoting clarity, but I find if you have dry areas like me, or will be in a dehydrated environment (like air-conditioning), you should use a protective primer beneath for extra conditioning and lasting power. 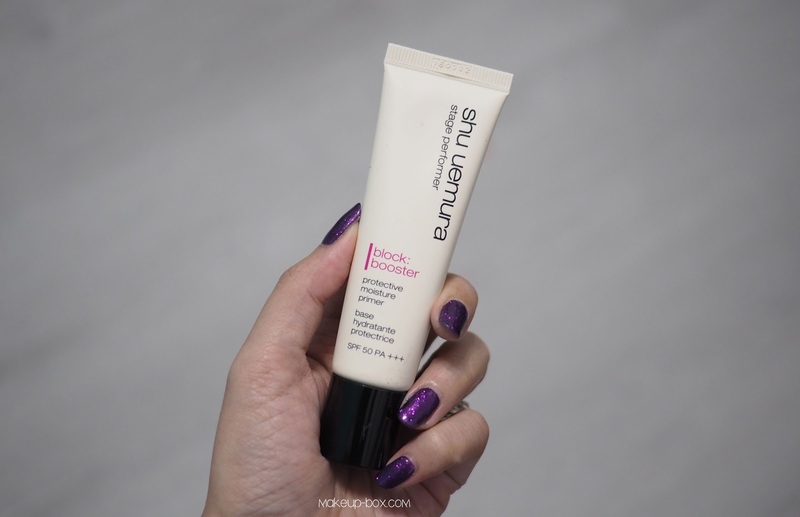 I've been using it on top of my block:booster primer for the hefty sun protection. 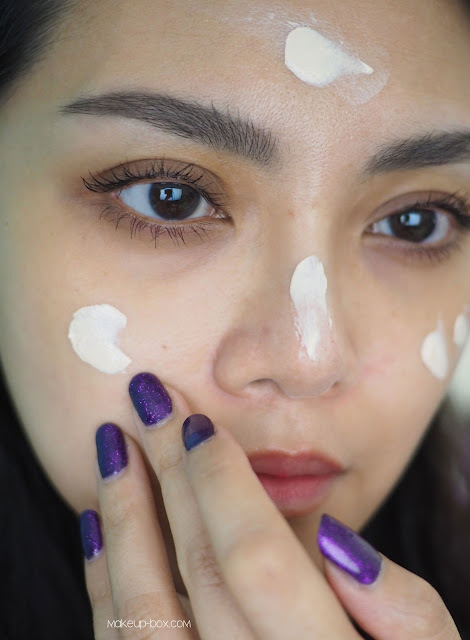 If you have oily skin, you can let the primer sit for a few minutes and then very lightly press a single-ply sheet of tissue over your face to lift any excess moisture before applying foundation. This gives you the staying power and protection, but allows you to retain a more matte finish. 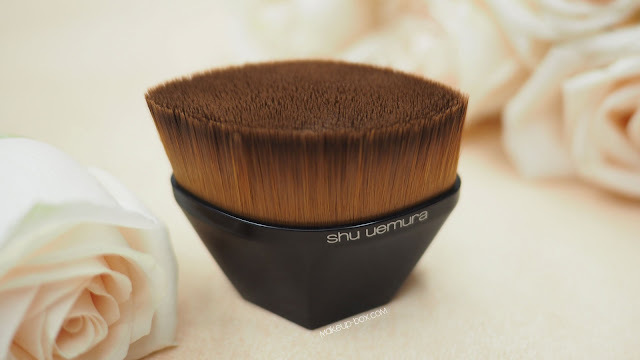 As for the application of the foundation itself, you can go ahead and use fingers or whatever brush or sponge you want, but of course I had to try out Shu Uemura's newest buffer brush. Named Petal 55 ($80) for its width, this new brush is designed to work with any foundation texture; powder, cream, liquid, and will give you seamless smooth coverage in a minimal number of strokes. 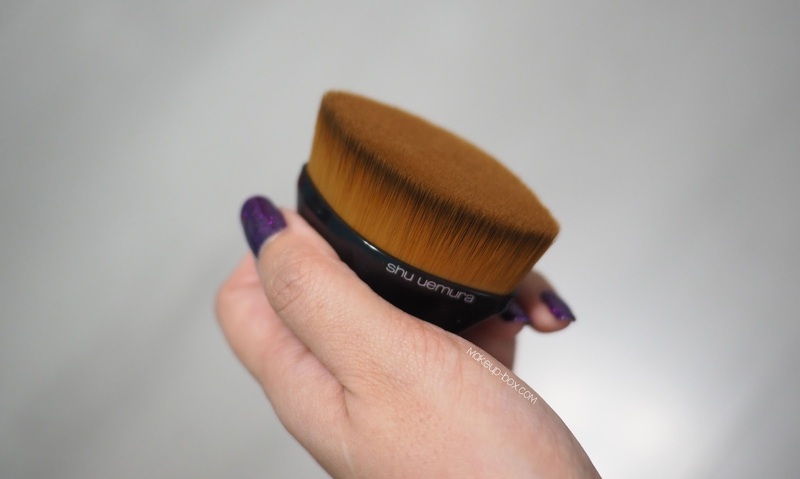 If you've ever been fascinated by those "shower-brush" Artis brushes, this is like a flattened version with more surface coverage and control because of the ergonomic design and the easy grip in the palm of your hand. The bristles are dense and ultra-soft but retain their shape without any scratchiness on the skin. And I especially like the pointed ends which fit easily under the eyes and around the nose without needing a separate brush or tool. You do NOT have to buff back and forth to get a seamless blend, unlike when using a rounded buffing brush. The bristles are designed so you only need to buff in one direction over each area. So no circles or wind-shield wiper motions please. I also suggest applying foundation to the skin instead of pumping directly into the brush bristles. When you do the latter, you end up over-loading certain sections of the brush (whichever one you use), which actually makes for a less even blend. You also waste more product and make it harder to clean out your tools. Another slight con is the gorgeous velvet poreless finish doesn't stay all day. Then again, even matte foundations seldom stay perfectly fresh and matte all day without fixing mists and blotting, so I can't say if this is a valid "con". 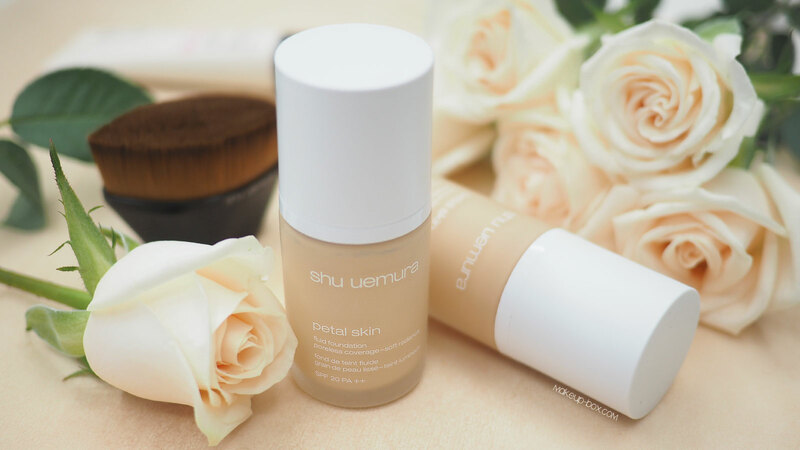 If you're on the lookout for a new foundation that marries lightweight radiance with decent coverage and a polished semi-matte finish (who isn't?!) you should probably try this out to see how it works on your skin. 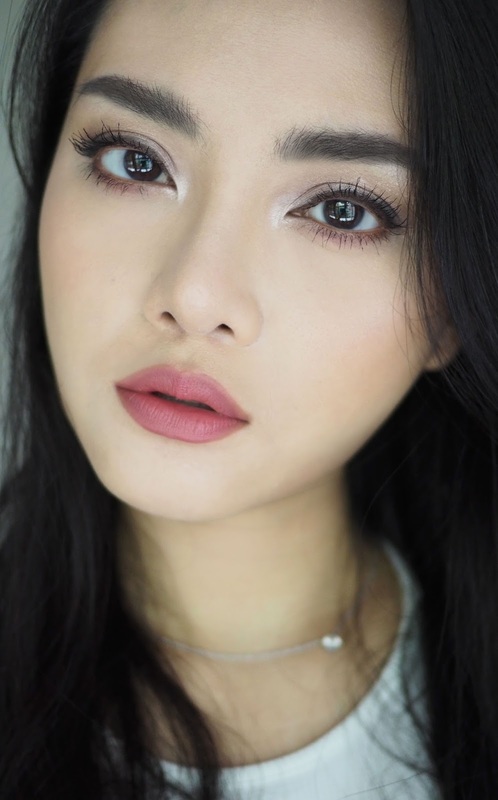 This is a great option for normal and combination skins in my opinion, and a definite go-to for casual daily wear because it gives that flawless but not overly made-up look. This may not be the highest coverage, the most matte, the most glowy, the most hydrating, or the most long-wearing product around. But it does manage to straddle a bit of everything. And it feels and looks so darned beautiful for a few hours. All in all though, it's worth getting a sample and trying it out for yourself soon. I also do recommend checking out Petal 55 if you love buffing brushes in general and just want something super quick and fuss-free to use. To learn how to create your perfect petal skin canvas, Shu Uemura is conducting a month-long activity in Singapore where you can enjoy a 15 min session with a beauty advisor at one of the counters or boutiques, who will help you find your perfect shade match, guide you through a tutorial to achieve a flawless petal-inspired makeup look, AND send you home with samples of block:booster primer and Petal Skin Foundation. Disclaimer: This is a sponsored post but opinions are as always truthful and based on personal experience after extensive testing. Easy Navigation Search box available on Mobdro to get your favorite movies or sort by genre, rating, popularity, and more.https://mobdroappdownload.co/ Get latest updated links and files over here. good With Cinema Box HD Movie experience is more fun. It can able watch any kind of movies on android only. http://cinemaboxhddownloads.com/ One of the website will help people to install it without any problem. very smooth foundation usually foundations are not much smooth.. Outstanding base and what a lovely brush/.. Thanks to Dr Bude for bring back my lover, am not here to tell you much story but i want to inform you when ever you are passing through emotional problem Dr Bude is the tested and trusted i am a living witness of it contact him on budespelltemple@hotmail.com his the only man that help me out when i was in problem with my lover.contact him now without no delay for your problem to be solve once and for all. Mobdro premium apk download and install the latest version on Android device. Download the BHIM app from here. Find the Step by step process to Install BHIM Android version. address spiritualhelpcenter@gmail. com he is a good man and i will forever be grateful to him. My name is Dee Winter and I base in USA...“My life is back!!! After 14 years of Broken marriage, my husband left me and our two twins . I felt like my life was about to end i almost committed suicide, i was emotionally down for a very long time. Thanks to a spell caster called Dr Ehi which i met online. On one faithful day, as I was browsing through the internet, I was searching for a good spell caster that can solve my problems. I came across allot of testimonies about this particular spell caster. Some people testified that he brought their Ex lover back, some testified that he restores womb,cure cancer,and other sickness, some testified that he can cast a spell to stop divorce and so on. i also come across one particular testimony,it was about a woman called Sonia,she testified about how Dr Ehi brought back her Ex lover in less than 7 days and reverse the effect of their little boys cancer, and at the end of her testimony she dropped Dr Ehi 's e-mail address. After reading all these,I decided to give Dr Ehi a try. I contacted him via email and explained my problem to him. In just 3 days, my husband came back to me. We solved our issues, and we are even happier than before. Dr Ehi is really a gifted man and i will not stop publishing him because he is a wonderful man... If you have a problem and you are looking for a real and genuine spell caster to solve all your problems for you. Try Dr Ehi anytime, he might be the answer to your problems. Here's his contact: shomorikaspelltemple@yahoo.com or you can easily reach him via his phone number +2349035080936 Thank you Dr Ehi. beauty ness always will give you full off energy and full off confidents. one of the best article i seen recently. thanks for sharing this. by using your tips people will get lot of benefits. There is no matter abut out side of beauty. people will look at inside of the beauty. But what you given information that was good for beauty lovers. thanks for sharing. Download Terrarium TV for Tablet will tell you process of how to use terrarium TV on tablets. kindly go through here. you get lot of fun. It was really awesome article dear. thanks for sharing your article. Glamour will give inside confident. thanks dear for sharing your wonderful article. when you have confident inside you will become tuff to people. that will on out side confidents. Cyberflix TV iPad | Cyberflix TV iPod. it's very impressive information dear. and useful information for woman.